Stock Interiors is proud to offer the highest quality Seat Upholstery in the market today. Our seat upholstery sets are a high quality product following the factory pleat design, sewing pattern and factory attachment points. Includes upholstery, instructions, hog rings and hog ring pliers. 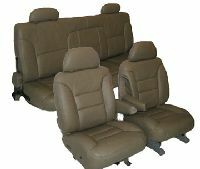 These items require physical seat be removed from vehicle, old upholstery removed and new upholstery installed. OIur seat upholstery is replacement seat upholstery and is not slip on seat cover. We offer many original materials and colors, as well as custom options and leather upgrades. Our Custom Seat Upholstery items have 4 ratings with an average score of 4.72 out of 5 stars.